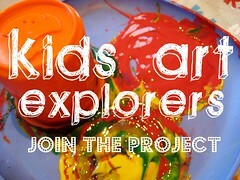 Kids Art Explorers: join the new challenge! This year we are undertaking lots of different art experiments. We’re exploring materials, techniques and styles and seeing where our creativity takes us. We’re celebrating the process of art: trying new things, having a go, being daring, making mistakes. We’re interested in how things turn out but much more focused on the fun we have along the way. 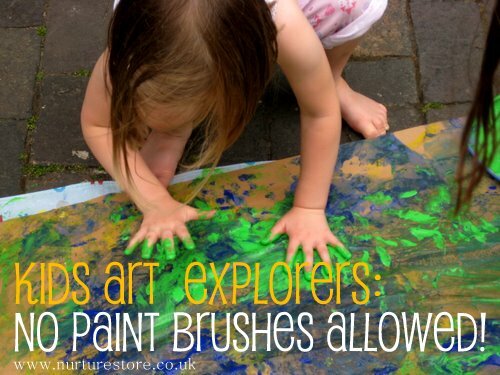 Kids Art Explorers Project Three: no paint brushes allowed! This month the Kids Art Explorers are trying out some painting, with one important rule: no paint brushes allowed! Join in the fun and try making some art with anything you like so long as it’s not a paintbrush. There are some ideas to get you stared on the Kids art Explorers Pinterest board. How about painting with flowers, cotton buds, party blowers, tennis balls or even udders? Let your imaginations go wild and see what you can discover at home or in the garden to use to paint with. When your children have made something, please come and share it with us. We’re celebrating kids art exploring so whatever you make, however it turns out, whether it’s complex, messy or simple, we would love to see it. :: There is a linky here, so if you are a blogger please link up. The linky is open for a month, so link up when you’re ready. I’ll be sharing what my girls make over the next few weeks. :: If you’re not a blogger, take a photo and post it on our Facebook page. :: All creations will be featured on the Kids Art Explorers Pinterest board, our very own on-line art gallery. If you would like to include a button in your post, please do grab the code but you may need to change the ” to get it to work. Alternatively please feel free to copy the image and add a simple text link back to this page. I would love it if you would share the project with your friends and readers and invite them to join in.